Forums » Professional Video Editing & Finishing Forums » Avid Media Composer - PC » Avid or Nvidia issues? Latest post Wed, Jun 28 2017 8:18 AM by MattB. 14 replies. Im getting a few issues that I cant get to the bottom of and I can't work out where the issue lies. First - I used to be able to get thumbnail images for title mattes etc by highlighting and then presing the 'home' key - cant do it now, has that facility been removed? Second (and more annoying) Avid freezes if I try to play a thumbnail image (to play through to a more informative image for the clip). I get an error message from Nvidia OpenGL which says the application has requested more memory than the systen has available, and Avid closes and I have to restart. I have learned to constantly Ctrl-S to keep saving my work. (I cant find the autosave frequency setting now either). Anybody got any ideas? Thanks in advance. You are working with MC 8.8.4v? 8.8.3 at the moment (Edit 1 in my system specs), Havent got round to updating yet, dont like to when I'm mid project. Good idea not updating while in the middle of project. I open a support case for you 03222204, noted that you're in a middle of a project. But have got nowhere, any help would be appreciated. Im going to get a case started.... are you able to send or post me myour settings? I trust your specifications are up to date right? Nothing so far has made a difference, MC still freezes if I try and play a thumbnail. 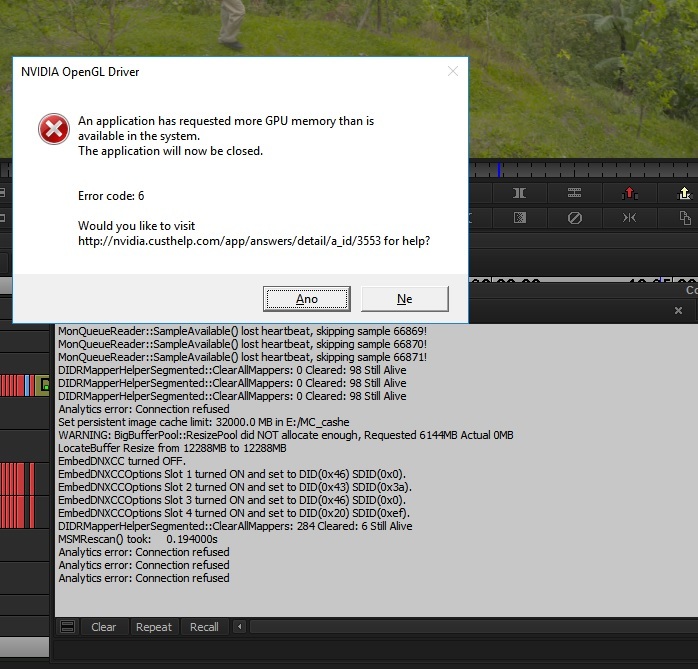 I have the same error "error message from Nvidia OpenGL ...." when using Multicam. We all have the Quadro 4000 card in specifications. It helped me return to the 353.82 driver. With the new drivers provided with the MC8.x.x installation (362.13, 375.86, 377.11), there are problems with the graphics card memory. However, thumbnail playback, which I do not normally use, but tested, generates an error and closes the application. I have a case open with support already. I believe my Nvidia 3D settings are set to maximum performance already, but I'll check later today. And Im going to try Vilem's suggestion to roll back the driver.. All later today when I can get back to the machine. So, rolling back to Nvidia Driver 853.82 did the trick, thanks for the pointer, Vilem. All I need to sort out now is how to get thumbnail previews for title mattes again!